Slippery or snow-covered roads, reduced visibility and the cold: these are all conditions that can make winter driving difficult. They are also the conditions that can make getting stuck in the snow or a car breakdown treacherous if unprepared. But, with an emergency kit for your car, you could find yourself back on the road quicker if you run into problems. 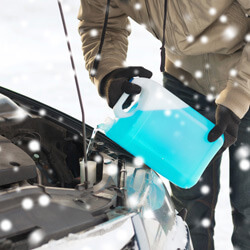 With flurries in the forecast for much of Canada, now is the time to put together your winter car kit. And, to help you get ready, we've listed a few of the most common items you should consider including in it. While it may seem like a lot to haul around, you can pack your customized kit into a plastic storage bin (or two) to keep your trunk organized. That way, you'll know where to find everything. And, if you don't want to build your own kit, you can also buy one. If you decide to go this route, look over what's included in the kit and add any items that you think are missing and necessary. No matter what the season, your auto insurance is there should anything go wrong, but, when was the last time you checked to make sure you weren't overpaying for it? Compare car insurance quotes today for a better price at Kanetix.ca. Updated annually when the snow starts to fly. We are happy to share our content. If you are a publisher who wishes to use our content, please ensure that the original source URL or the www.kanetix.ca homepage is credited. It is also possible to earn revenue from content deployed through our Content Publisher Programs. © Since 1999. Kanetix Ltd. All rights reserved. Kanetix.ca. :: Did you know: Kanetix priority phone lines connect you faster to the insurance partners you want to talk to. :: Did you know: No hidden fees ever. Kanetix is a 100% free service.